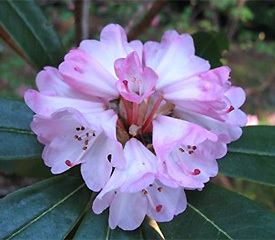 Flower/Truss Description: Campanulate, white to pink to reddish magenta, sometimes spotted purple. Truss has 10-30 flowers. Foliage Description: Leaves oblong to ovate-lanceolate, up to 5½" long, thick white to fawn indumentum.